Sorry for the slight hiatus the past couple of days. I have been soaking up the first few days of having a life again and not studying for exams! Within my family, it is a well known fact that I was a bit peeved with how late I got out this year and how the later date interrupts how soon I can be overwhelmingly jolly for Christmas. With only a few days left before Christmas I have a lot to fit in and check off before the holiday quickly becomes a cleanup task. 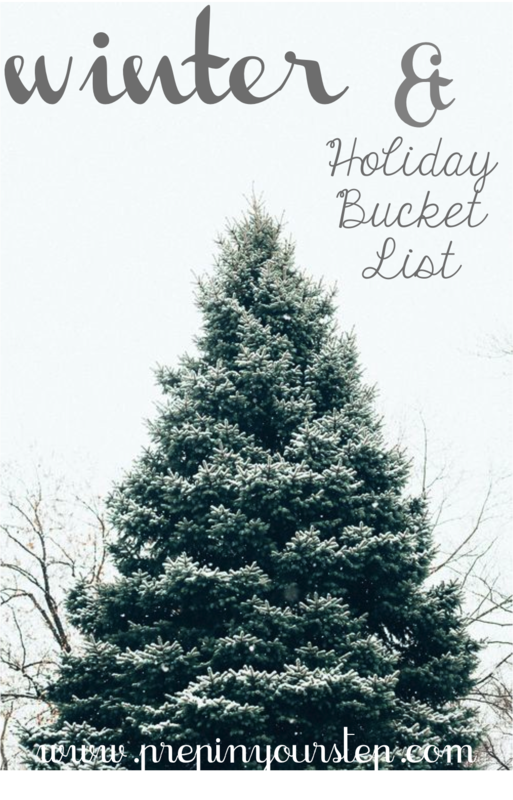 Since I tend to work best with to do lists I opted to make a bucket list for the remainder of the holiday season and the winter season that has just begun. And any other sweet treat for that matter. I love baking and used to use it as a stress reliever back in high school. Since I don't exactly have the best kitchen to use at school I use breaks, especially Christmas to catch up on all the baking I've missed throughout the semester. Christmas cookies are some of my favorites to make since I can enjoy both baking and decorating! Enjoy a snow day (fingers crossed). Let's hope the weather cooperates with me on this one! I loved having 3 snow days last year and would be thrilled with the same luck this year. Sledding, cozying up inside, snow angels, and drinking hot chocolate are all things I hope to see in my future. Check and check. I am so excited for all of the gifts I purchased for my family this year and another perk, they are already wrapped! I've already accomplished this one as well and would love to have multiple checks in this box. I love ice skating and think that it is such a fun winter outing to partake in. Get a group of your friends together and make way to the rink! Winter break is just beginning for you to log onto Netflix! I am well on my way to watching all of my Christmas movie favorites and have enjoyed lounging around between blogging and hanging with my family and friends. Find my all time favorites here. The past few years I have hosted a Christmas cookie party and love the preparations that go into it. While I wasn't able to pull it together before Christmas I am hoping to host some sort of similar post Christmas party! Curl up by a cozy fire. Winter is the perfect time to be cozy and I adore the coziness fires provide. Grab a book, a blanket, or your laptop and take a seat next to the crackling flames. I definitely want to be spending some of my break near a fire! Lights epitomize the holiday seasons and I am definitely hoping to drive around and enjoy the lights of the season! What is on your winter & holiday bucket list? Great list! I have already done about half of this list so this made me feel very productive! Thanks haha! Buy Top watches on Sale, Buy Cheap Top Replica watches and High Designer Replica watches from online watch shop. We offer Over 10000 Luxury Watches. Franck Muller King Conquistador Designer replica watches with excellent styles, overall luxury brands, and discount replica watches for cheap, shop cut-price watches online. Realize your dream now!